There could be a no more fitting description for this Edna Valley winery. Born in 2013, Biddle Ranch Vineyard is a relatively new name when it comes to Central Coast wineries, but they seem like veterans already. Using the natural beauty of their coastal community as inspiration, the Biddle Ranch team are dedicated to producing quality wines “that embody our eclectic spirit and our passion to bring people together”. Located in the center of Edna Valley, Biddle Ranch wines benefit from rich oceanic and volcanic soils, cool maritime fog, and lots of afternoon sunshine. Perfectly located between San Luis Obispo and Arroyo Grande, the growing season here is the longest in California resulting in rich and fruit-forward wines. 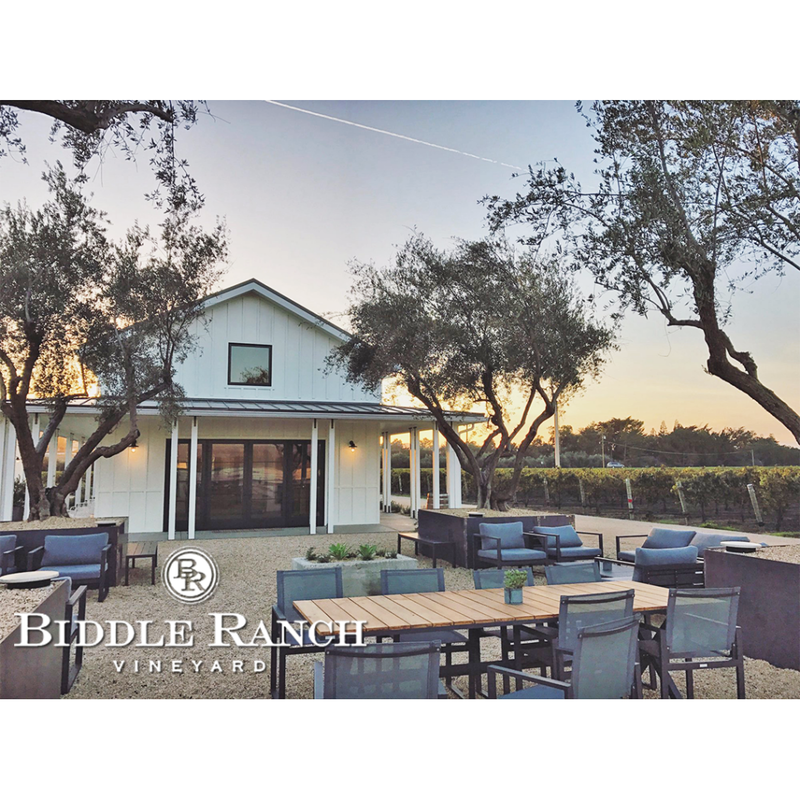 Producing whites, reds, sparkling wines, and Rosé, Biddle Ranch is committed to having a quality showcase of diverse wines. Once operating as a tasting room in the small town of Avila Beach, Biddle Ranch Vineyards has expanded in recent years, moving to a building on Biddle Ranch Road just off Highway 227. A modern farmhouse-style venue now sits on the property overlooking the pristine Santa Lucia Mountains. Sip under the olive trees in the outdoor picnic area or enjoy the sleek ambiance of the tasting room. Bring a picnic to enjoy outside or try a cheese and cracker plate from the bar—part of luxury is personal preference! We would also be remiss if we didn’t stress the importance of hiring professional transportation to keep you and the people you care about safe for whatever event you plan! Alongside the tasting room and across a small walkway sit a house as beautiful as its surroundings. The Vineyard House at Biddle Ranch is the perfect mixture of elegance, simplicity, and contemporary aesthetics. Sitting next to a 23 acre Chardonnay vineyard, the house has amazing photo backdrops around every turn. With just over 3,100ft of living space and plenty of outdoor space, this venue is perfect for an intimate wedding, family gathering, or just a weekend away from it all. For more details on reservations, event set up, or other inquiry please visit their website. Thinking about a wine tour in SLO? Read this quick guide to wine tasting etiquette on the Central Coast, and 5 Reasons Wine Wednesday is Important!